A lot of travel checklists for dogs include a first aid kit. 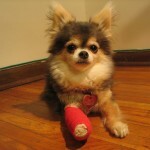 Dog Jaunt’s travel checklist didn’t, until now, because the only first aid item I’ve ever used was a pair of tweezers. Any crisis Chloe faced that wasn’t small and thorn-like, I thought, would be best left in the hands of an expert — so I focused on identifying local vets and emergency clinics in the locations we visited, and crossed my fingers. A recent post on Helen Fazio’s dog travel blog (called Travels with My Dog) has changed my mind. Guest blogger Carol lists some simple remedies and equipment for problems like itches, hot spots, indigestion, small cuts, the swallowing of (small) inappropriate items, and eye irritation. Her directions are straightforward, and will help you handle minor problems on your own, or keep your dog as comfortable as possible until you can locate a vet. I suggest adding tweezers and an Elizabethan collar alternative (I like BiteNot best, but ProCollar packs smaller) to the list. If you choose a digital thermometer, be sure to pack a fresh battery for it (if it needs it — some come with a long-lasting lithium battery). Make a list of the items you’ve bought, and package them, the list and Carol’s notes in a large Ziploc bag to keep everything organized and visible. Be sure to check the expiration dates from time to time to keep your kit current!